Bird’s Nest, which is also known as the National Stadium, is one of the finest Olympics architecture. Located at the southern part of the Olympic Green in Beijing, the Bird’s Nest is the largest steel structure architecture in the world with using 110,000tons of steel which were all made in China. During the Olympics, there are 91000 seats, including 8000s permanent and 11000 temporary seats. It is the venue to host the opening and closing ceremonies of the Beijing Olympic Games and Paralympic Games, the track and field competitions, and the football finals. The Bird’s Nest will continue to host sports. Designed by Pritzker Architecture Prize Gainer Jacques Herzog, de Meuron and Chinese Architect Li Xinggang, the Bird’s Nest is shaped of a bird’s nest from which derives from its name. It is also like a cradle which carries people’s hope of future. In addition, in Chinese mythology, the sun and moon are respectively represented by a circle and a square, reflected by the shape of the Bird’s Nest and the Water Cube. At night, the Bird’s Nest and the Water Cube are respectively lit to be red and blue. All the designs are not only depended on the first-rate technology but also embodied the traditional culture of China. The ground was broken on 12 Dec 2003 and completed in March 2008, with the total cost of more than 2.26 billion. There were 17.000 construction workers at the same time worked in the stadium. 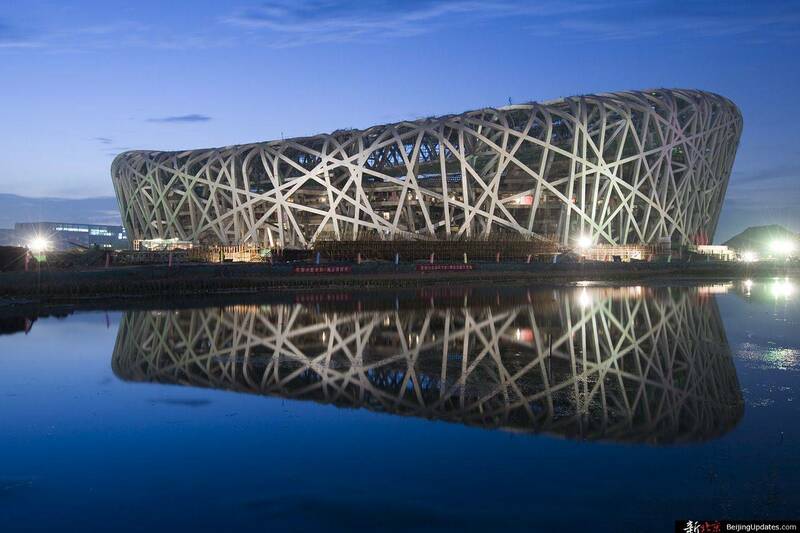 The shape structure of the Bird’s Nest is mainly consisted of steel structure with 24 truss pillars in total. The long axes is 332.3 meters and the short axes is 296.4 meters. The highest point is 68.5meters and the lowest point is 42.8meters. The eastern and western parts of the Bird’s Nest are higher than northern and southern parts, in order to improve sightlines. The construction materials are first-rate fire and rainfall resistance. And it can withstand eight-magnitude earthquake. Lots of construction experts consider that the Bird’s Nest is not only a unique architecture for the 2008 Beijing Olympics but also a landmark of the world architecture development. The distinctive Bird’s Nest will be potent historical evidence of architecture of 21th century. And now, it is one of the most popular attractions of Beijing.